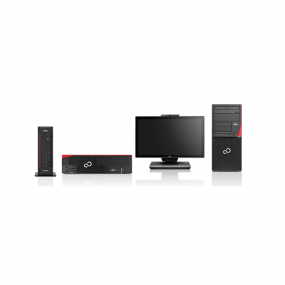 The FUJITSU ESPRIMO family offers you a complete range of fully featured and highly expandable PCs that you can rely on to run the office applications of today and tomorrow. Best-in-class Fujitsu development and outstanding production quality ensures superior reliability. Power supplies with world-class power efficiency to lower your energy bill and reduce your environmental footprint. In fact, devices with up to 94% efficient power supply technology reduce energy costs by up to 40% compared to a 4-year old PC. With individual configuration options and the unique DeskView Load pre-installation solution, FUJITSU ESPRIMO Desktops help you reduce deployment costs and flexibly manage each system for years to come.